Attribution: The models can be used in renders or animations without attribution, but if you want to distribute the models you must attribute them to Scopia Visual Interfaces Systems, s.l. 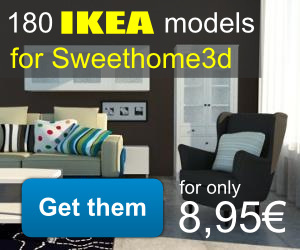 (http://www.scopia.es) and Eteks (http://sweethome3d.com) adding a link to both sites, and you have to add a copy of this license or a link to this page. Can I use objects on the web for my manga? Can I use it for commercial purposes? To create the image 3D sold through shutterstock and interested in using your model with my work. Can I use your model in my work? WOW! Thank you very much for your kindness. there is a lawn mower (black/yellow) at Sweethome and they name Scopia as the creator, but I can’t find it here in your blog. Are you the creator, and if so, which license (or more precise which conditions) is valid for it ? At sweethome and here CC 4.0 unported is mentioned, but here you also give the permission to use it without attribution and license link if only used in renders and not distributed ?